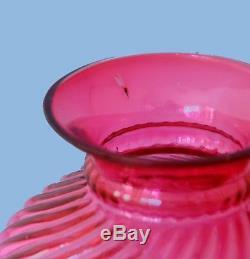 RARE Antique Cranberry Ribbed Swirl Art Glass Miniature Oil Lamp with fancy applied feet, S1-539. 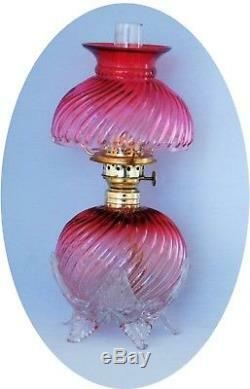 Cranberry Ribbed Swirl Art Glass Miniature Oil Lamp, S1-539. About 8 tall to top of shade. About 3 1/2 wide from foot to foot. 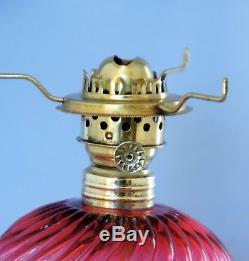 Antique Ribbed Swirl Cranberry Night Lamp. Applied crystal feet and leaves fluoresce under "black" light. Excellent condition; small chip on one of the applied feet; small bubble on inside of shade. 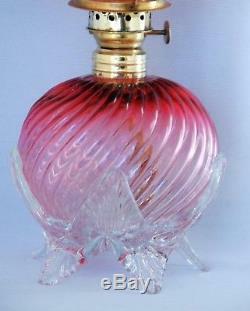 Antique cranberry glass was made with real gold. This beautiful art glass miniature oil, or night, lamp is shown in Figure 539 of Frank & Ruth Smith's book "Miniature Lamps". So, we'd agree that this lamp is quite rare and certainly very hard to find. By the 1890s kerosene fueled night lamps had transitioned from being purely functional items to being decorative household accent items--pieces that were meant to please and/or impress as well as to provide a little light at night (and many may not have been actually lit). Lamps like this one are hard to find because they were expensive and time consuming to make and relatively few were made. First, the manufacture of cranberry glass (as described in the note below) required the use of real gold and a careful process of heating, cooling and reheating the molten glass. 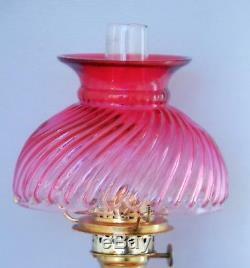 Second, it required a skilled glass artisan to create the fading of the color which is a characteristic of this lamp (our references describe this color of this lamp fading to clear at the bottom of both the shade and the font; on this lamp the color does fade, but not quite all the way to clear). Finally the applied glass "leaves" which cradle the font and the fancy embossed feet had to be formed and applied manually, again by a skilled artisan. While we don't know what company made this lamp or exactly when it was made, we suspect that it was made here in the U. And was probably made in the late 1800s or very early 1900s (the peak of Victorian night lamp production). 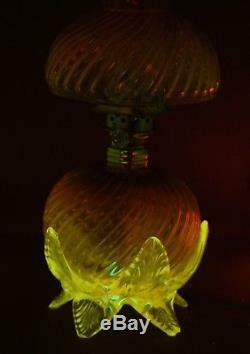 Because the clear glass applied feet and leaves glow, or fluoresce, under "black" light, we know the lamp was made sometime before the start of World War I (over 100 years ago) and is thus an antique. This fluorescence phenomenon is explained in more detail in a note below. We believe that it was made in the U. Because of the use of U. Condition of this lamp: This lamp is in excellent condition with only a single and hard-to-notice small chip on one of the five applied feet. There is also a small bubble on the inside of the shade (see the next to last photo). There are no other discernible chips, cracks, defects or signs of damage. The old brass hardware on this lamp was polished by its previous owner. The collar has no splits or cracks and is firmly attached to the font. An unidentified Nutmeg-style burner (with a sun-ray-like pattern on the thumb wheel) screws tightly into the collar. The round vent holes on the burner are larger than the similar holes on Plume & Atwood Nutmeg burners. 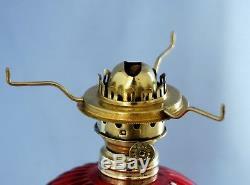 The burner thumb wheel is not currently adjusting the wick that is in this lamp, perhaps because the wick is bone-dry. An old tripod holds the umbrella, or half, shade securely in place. The lamp comes with a clear glass chimney (with fire polished edges) which is also in fine condition. This is truly an outstanding example of an extremely hard to find Victorian night lamp, or miniature oil lamp. It is in excellent overall condition. 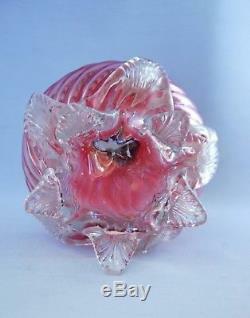 It is an elegant and attractive piece of Victorian era glass artistry. About the Use of Words Like "Scarce" and "Rare". We realize that some eBayers, not having or knowing of a better way of assessing an item's scarcity, use these terms quite subjectively and frequently based on their own personal experience. They simply don't know whether an item is common, scarce or rare. We take two steps to describe the scarcity of a lamp. First, we only use the words "Scarce", "Rare", "Very Rare", "Very Very Rare" and "Extremely Rare" if the item in question is judged to be so by an acknowledged outside and independent source. For miniature lamps, we use the ratings in Marjorie Hulsebus 2006 edition of the "Price Guide for Miniature Lamps". Marjorie's ratings are also somewhat subjective (they are based on the collective view of a panel of 12 experienced miniature lamps collectors--we were members of that panel). But were at least arrived at independently of the sale or offering of any particular lamp. We keep all of this data in an online database and make the database available free of charge to members of the Night Light Club and to others who have requested access. Fluorescence in Old Clear Glass. , found naturally as the mineral Pyrolusite, was used by by glass makers, as far back as ancient Egyptian and Roman times and up until about 1915, as a decolorizing agent in order to make clear, colorless glass. The natural material used to make glass contains iron impurities. These impurities impart a coke-bottle green (and sometimes brown) color to the glass. Manganese dioxide, added to the molten glass mixture, neutralizes the coloring effects of the iron impurities. Adding manganese to glass has a side-effect of which we doubt old glass makers were aware. While not itself fluorescent, manganese activates fluorescence in other elements or compounds. Clear glass which has had manganese dioxide added to it will glow with a green or yellow-green color when viewed under long wave ultra-violet ("black") light. This fluorescence turns out to be a useful test of the age of clear glass. The United States does not have large amounts of naturally occurring Pyrolusite; the mineral has to be imported from places like the Ukraine, South Africa, Brazil, Australia and China. After the outbreak of World War I in Europe, manganese became increasingly hard to get; first, it was considered a strategic war material (it is essential to iron and steel production) and, second, the normal supplies lines were disrupted by the war. And, so, after about 1915, U. Glass makers switched to other decolorizing agents e. Thus, clear glass which fluoresces (glows) under ultra-violet ("black") light can be presumed to have been made before 1915. Incidentally, manganese dioxide is also the compound responsible for the "sun-purpling" of old clear glass; when exposed to short-wave ultra-violet light (present in sun-light, or in germicidal lamps) over an extended period of time, the manganese dioxide will impart a purplish color to the glass. It has been reported that unscrupulous antique dealers especially in the Southwestern U. Would intentionally expose old glass to the intense desert sun (or to ultra-violet germicidal lamps) to create this purple color. Purists among glass collectors consider this to be a travesty and believe that intentional or artificial sun-purpling decreases, rather than enhances, the value of old glass items. Note that is can be quite challenging to get an accurate i. That looks the same as what one sees with their eyes photograph of the fluorescence in the glass. We work hard to get a photograph that looks like what we see, but there is usually some minor discrepancy either in the exact color or amount of the fluorescence. Should you examine a fluorescent lamp under black light, in a darkened environment, it will glow, but may not look exactly like the photograph we provided. 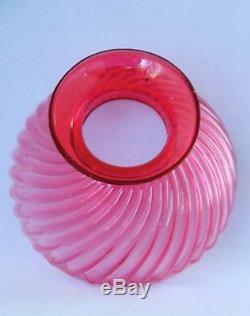 The manufacture of dark red, or "ruby", glass was a delicate and expensive process. It required adding a solution of gold dissolved in Aqua Regia (a mixture of hydrochloric and nitric acids) to the molten glass mixture. Getting the proportions of gold and acid correct was critical; minor errors resulted in an unattractive muddy color rather than the desired clear bright red color. The amount of the gold and acid solution added to the molten glass determined the darkness of the color. Somewhat less solution resulted in a lighter colored "cranberry" glass while more of the solution resulted in a deep red "ruby" colored glass. A further complication is that initially the resulting glass looks gray and only turns to the desired red color when the glass is reheated. Because of the complexity of the process, "ruby" or "cranberry" glass was generally only made in small or "craft" quantities. This process is believed to have been initially discovered by early Roman glass-makers. The process however was lost and was not rediscovered until sometime in the 17th Century either by Johann Knuckel in Bohemia or by Antonio Neri in Florence, Italy (experts are uncertain as to who deserves the credit). It was not however until the 1920s that the chemistry was understood and explained (by 1925 Nobel Laureate in Chemistry Richard Zsigmondy). The legend that ruby, or cranberry, glass was first created when a nobleman tossed a gold coin into a vat of molten glass is just that. A legend without a basis in fact since the gold would have had to been first dissolved in Aqua Regia. 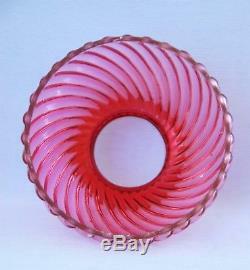 The height of ruby and cranberry glass production appears to have been during the Victorian era. The contents of this listing are protected by U. The use of substantial portions of this listing verbatim or with only inconsequential changes without the express written consent of the authors is prohibited. Our objective is to have happy, satisfied customers. We will work with you to satisfactorily resolve any problems. We try to answer all questions promptly. We do our best to describe all items accurately. However, mistakes and oversights can occur. Please also note that the receiving country's Custom Service may cause delays in item's arrival. Interested in learning more about miniature lamps? Want to meet other miniature lamp collectors? Please check out our other listings. 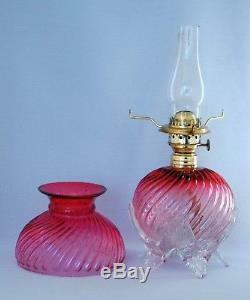 The item "RARE Antique Cranberry Ribbied Swirl Art Glass Miniature Oil Lamp, S1-539" is in sale since Sunday, January 14, 2018. This item is in the category "Collectibles\Lamps, Lighting\Lamps\ Non-Electric\Miniature". The seller is "kayschwartz" and is located in Stockton, New Jersey.